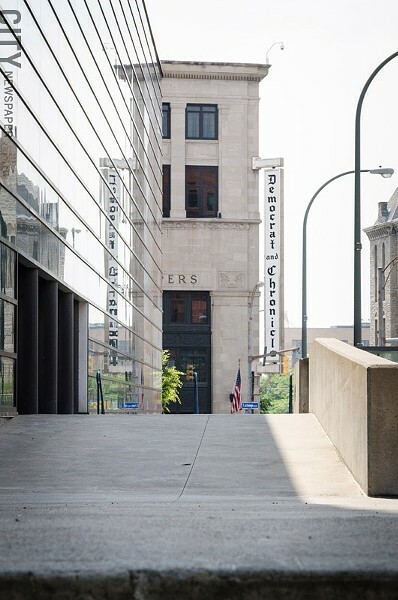 PHOTO BY MARK CHAMBERLIN The Gannett building: another historic downtown Rochester building is looking for a buyer. Standing next to the Gannett building at 55 Exchange Boulevard, it's immediately clear that the building is a monument to another time. Built in the late 1920's by Gannett founder Frank Gannett, the building's neo-Classical style exudes the authority and power of newspapers during their golden age. The building, which Frank Gannett constructed to house the newsroom and operations of the long-gone Times Union and now serves as the Democrat and Chronicle's office, was recently put on the market. The asking price for the 154,000-square-foot building is reportedly just shy of $5 million. The Gannett building is the latest in a long string of Rochester's iconic downtown buildings to end up on the sales block. The big questions now are who will buy it? And how will it be used? Savvy developers have purchased many of these downtown buildings for re-use, but other buildings have lingered on the market for years, often sitting vacant. The Gannett building is in an area of downtown that has traditionally been home to large institutional structures like government offices, churches, and financial companies. But the building is probably not best suited for office space, says Heidi Zimmer-Meyer, president of the Rochester Downtown Development Corporation. Her company tracks downtown construction projects and redevelopment. "The office market in this region is soft," she says. This is a reflection of the recent economic recession, she says. But it's also because companies have fewer employees due to advances in technology and they require less space. "Commercial space has taken a real hit, not just downtown, but all over," she says. "We don't need more office space downtown. We need less." Housing has been the main driver of downtown investment, she says. There are more than a dozen projects in what she calls the pipeline to completion. "Since 2000, we now have 38 buildings converted to housing that were either downtown offices or some kind of light manufacturing," Zimmer-Meyer says. "What we call downtown is now a collection of probably 14 neighborhoods that are very distinct. And this particular neighborhood, the Four Corners area, is defined by buildings with a lot of architectural character." Converting the Gannett building to housing wouldn't have been conceivable even five years ago, Zimmer-Meyer says, because the buildings in the area and the area itself have been somewhat institutional. Developers were wary of trying to create housing in a section of downtown that many thought was too close to the Blue Cross Arena and the Public Safety Building to attract apartment hunters. But two projects helped to change their minds, Zimmer-Meyer says. First, the former Central Trust Company building, with its 1950's glass and metal design at 44 Exchange Boulevard was given a $6 million update. Comprised mostly of apartments, the owners embellished the building's retro style. And a multimillion-dollar restoration converted the formerly vacant Academy building to a combination of market-rate housing and retail. Built in the late 1800's, the Academy building is the former home of the high-end eatery, Edwards Restaurant. The Gannett building, though it appears to be in good basic condition, will require what some developers describe as a "gut to rehab," says Zimmer-Meyer, which essentially takes much of the building down to its bare bones. "Developers have been most successful when they are respectful of the uniqueness of these buildings," Zimmer-Meyer says. "They've created spaces that really take advantage of that, celebrate that, and don't cover it with drywall or something. Exposed brick, polished floors, tall ceilings, high windows, and quirky things like gargoyles and carvings — things like this you can preserve in the redesign are what this market wants." The Gannett building was added to the National Register of Historic Places in the mid 1980's. The original building was constructed under the supervision of Howell and Thomas, a Cleveland-based architecture firm, says Cynthia Howk, architectural research coordinator for the Landmark Society of Western New York. And well-known industrial architect Albert Kahn oversaw one of the larger additions to the building in the 1940's. The addition housed the printing operations, Zimmer-Meyer says. "That was one of the great treats of walking through that area of downtown," Howk says. "You could look in those great big windows and see the printing press running." It was not unusual for cities across the country, Rochester included, to support morning and evening newspapers through much of the 20th century. And the Democrat and Chronicle's news organization moved into the Gannett building, joining the Time Union. But the collapse of evening editions was a sign of industry changes to come. The building at 55 Exchange Boulevard served as Gannett's corporate headquarters until the mid 1980's, when the headquarters moved to its current Virginia location. 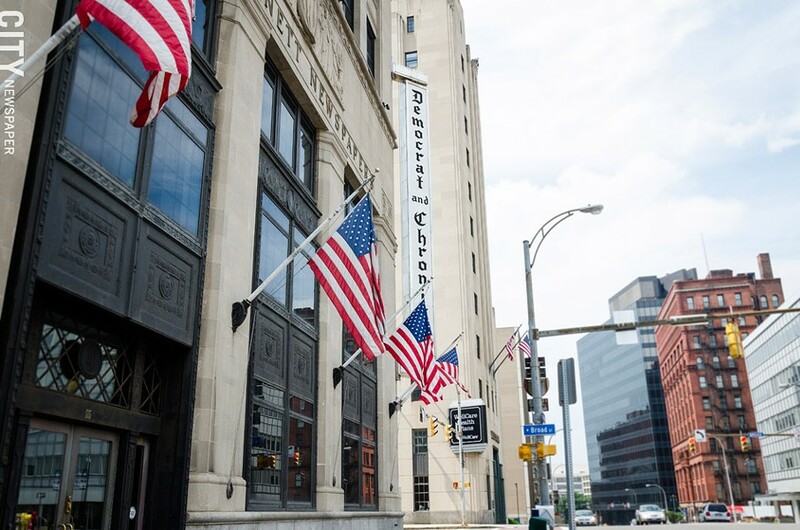 The Democrat and Chronicle news group is looking for a new location in downtown Rochester. Though Zimmer-Meyer says she's unaware of any developers interested in the Gannett building, she says she's optimistic. Her organization is tracking downtown development projects totaling more than $700 million, she says, with more than half coming from private sources. The influx of private money may be the best indicator that the commercial real estate market is on the mend, since only three years ago it was extremely difficult to find lenders for big projects. Zimmer-Meyer says that three significant projects under way are going to significantly change downtown: Midtown Tower, the Sibley building, and Alexander Park. Plans call for converting the Sibley office tower into market-rate rental apartments and possibly senior housing. Though Buckingham Properties and Morgan Management have not yet completed the purchase of Midtown Tower, Zimmer-Meyer says that between 170 and 185 residential units are planned for that site. And Buckingham Properties plans to add new housing to Alexander Park, site of the now demolished Genesee Hospital. "We have over 5,000 people living downtown now, adding 1,900 since 2000," Zimmer-Meyer says. "We have another 1,600 to 1,700 [projected]. I think we're getting up to 6,700, and it's still climbing." All of this development has finally helped downtown reach that much anticipated tipping point when major retail would return, she says. The most significant development would be a downtown grocery store, and Zimmer-Meyer says there are three entities talking about possible locations. "Certain kinds of retail are turning their heads and taking a second look, including the grocery stores," she says. "We'll have to wait and see what really happens. But at least the talk is there, and for a long time it wasn't."